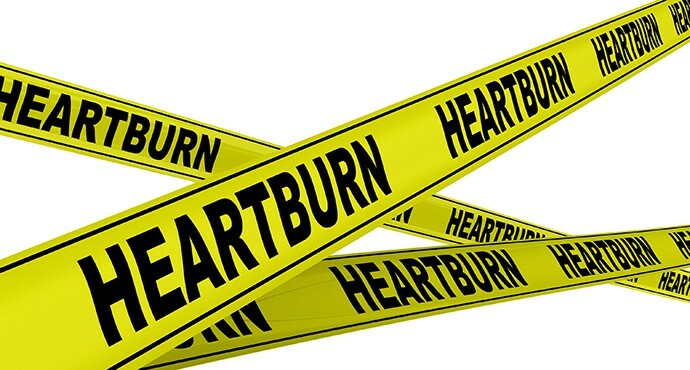 Do you, or someone close to you, regularly suffer from heartburn or reflux? Do you regularly use antacids? You may have a condition called Gastro Oesophageal Reflux Disease (GORD). Gastroesophageal Reflux Disease (GORD) is a digestive condition affecting the lower ring of muscle that acts as a valve connecting the oesophagus with the stomach. In those suffering from GORD, the ring of muscle opens spontaneously or doesn’t completely close, and the stomach’s content including food and digestive juices rises up into the oesophagus and the mouth. Occasional reflux is common, however persistent reflux that occurs more than twice a week is regarded as GORD and can develop into more serious health problems. What are the signs of GORD? Most commonly adults report heartburn – also referred to as indigestion. This burning sensation is usually felt in the lower part of the mid-chest to mid-abdomen, behind the breastbone (sternum) and is caused by the release of stomach acid into the oesophagus. This acid taste can also be felt in the back of the throat and occasionally food and acid is regurgitated into the mouth, which feels like a small uncontrollable vomit. Other symptoms include indigestion, gastric pain, nausea and bloating. All symptoms of GORD tend to be more common after a meal, though are generally intermittent and unpredictable. The majority of children and some adults with GORD do not experience heartburn as a symptom. This is colloquially referred to as “silent reflux” as the symptoms instead include dry cough, asthma symptoms or difficulty swallowing. In many cases the first sign may be acid erosion of the teeth caused by regular exposure of the teeth to stomach acid. Your dentist may be the first to notice the signs of GORD and it is one of the many general medical conditions that Medland dentists consider as part of your routine dental examination. Unfortunately the direct cause of GORD is still unknown. Having a hiatus hernia may contribute to GORD. Smoking is thought to relax the muscles which act as valve connecting the oesophagus with the stomach causing it to spontaneously open, causing reflux. Stress and anxiety are commonly associated with GORD. Obesity and obstructive sleep apnoea (OSA) are linked with GORD which happens at night. The oesophagus to stomach valve can also malfunction when the pressure in the stomach is more than it can withstand –after a large meal, when wearing tight clothes, during pregnancy or different postures (e.g. bending over, slumping, lying down) and in those with obesity. Chronic untreated GORD can lead to serious complications. Long-term inflammation of the oesophagus from stomach acids can cause oesophagitis. This is when the damage to the lining of the oesophagus results in bleeding or ulcers. Chronic irritation of the oesophagus can result in the tissue scarring, which narrows the oesophagus, which makes swallowing more difficult. Research has also found that GORD may contribute to asthma, chronic cough and pulmonary fibrosis. Barrett’s Oesophagus is a serious condition that may result from long term untreated GORD. Damage to the lining of the oesophagus (e.g. from acid reflux) over a long time period causes abnormal changes to its cells. In some cases of Barrett’s Oesophagus the cells develop into cancer, which generally has a poor prognosis. If acid reflux or regurgitation is frequently experienced in the mouth, the teeth are potentially being damaged in a process called tooth erosion. Stomach acid has a very low acidic pH of approximately 2 and over time will irreversibly dissolve away the hard outer layer of enamel of teeth. This destruction of tooth structure can cause sensitivity as the inner dentine layer containing nerve endings is exposed. If GORD is left untreated over many years, the stomach acid can significantly wear away tooth structure, shortening teeth, affecting the bite, exposing nerves and affecting your smile’s appearance. How can I prevent dental problems if suffering from GORD? If you experience an episode of acid reflux or regurgitation (vomit) in your mouth do not brush your teeth! The acid will have softened the enamel so using a toothbrush will literally brush away the tooth structure. Avoid brushing your teeth for 30 minutes and instead drink (or swish around your mouth) plenty of water to dilute the acid. Chewing sugar free gum will stimulate saliva – the body’s buffering defence mechanism to neutralise acids. Smearing toothpaste or Tooth Mousse™ onto the teeth will help to remineralise the damaged enamel. Ultimately the best way to avoid issues stemming from GORD is to treat the condition, starting with a consultation with your doctor. What treatment is available for GORD? If you think you are suffering from GORD or you have been using over the counter reflux medication like antacids for more than two weeks, we recommend you visit your doctor. Treatment is dependent on the severity of the condition, and usually begins with lifestyle modifications. These include avoiding food and beverages that worsen symptoms, eating small frequent meals, losing weight, quitting smoking and avoiding lying down within 3 hours of eating. If symptoms don’t improve, your doctor may prescribe medication to assist with controlling your GORD. Additional diagnostic testing such as endoscopy or a “barium meal” may be required to identify if you may have a hiatus hernia or structural problems with the oesophagus contributing to the problem. If medication and lifestyle modifications do not appropriately manage GORD, then surgery may be an option. Surgery can repair a hiatus hernia or strengthen the valve to control the backflow motion that is the hallmark of GORD. Treatment for teeth affected by GORD is dependent on the severity of the acid erosion. In mild cases it may just involve managing the tooth surface loss and sensitivity by reducing the intake of dietary acids, neutralising the acids, and using sensitive toothpaste or remineralising agents like Tooth Mousse™. Sometimes the erosion will damage the teeth to the extent that a filling is required to cover the soft inner dentine layer. Unfortunately in severe cases where the GORD has been untreated over a number of years a full mouth rehabilitation (full mouth crowns or composite resin “build ups”) may required to rebuild the function of your bite, provide comfort and restore the appearance of your smile. If you are concerned about the effect GORD is having on your teeth or smile, or would like advice on how to go about assessing your reflux, please ask your Medland dentist.